NEVADA COUNTY DEMOCRATIC CENTRAL COMMITTEE Who Thought This Was A Good Idea? Mastromonaco’s book is one of the most honest things I have ever read about behind-the-scenes political organizing, how people end up in politics as a profession, and what it looks like on the job. From her start on the John Kerry Campaign for President, to her stint on the campaign trail for Barrack Obama, to her professional career as the assistant to the president and director of scheduling and advance at the White House from 2009 to 2011, and then later as assistant to the president and deputy chief of staff for operations at the White House from 2011 to 2014, Alyssa Mastromonaco has led a substantial life with an unexpected career in politics. Who Thought This Was a Good Idea? chronicles honestly the years of someone who stumbled upon a career in politics and who succeeded in helping one of America’s greatest presidents. What makes the book unique, however, is that it’s a story about a woman whose young life was shaped during an incredible opportunity. 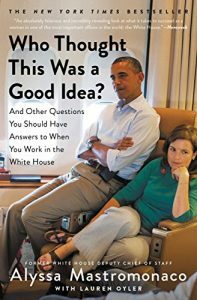 We see Alyssa Mastromonaco grow up in the Obama Whitehouse, struggle with Irritable Bowel Syndrome, adopt a cat, plan the response to the 2010 Haiti Earthquake, get engaged, and plan the trip with Barrack Obama to honor Nelson Mandela’s passing. It is a story of undaunted courage and simplicity in the face of unprecedented circumstances. It’s a picture of a life lived between the mundane and the exceptional.